James Cameron’s Terminator is a horror classic, and not just because of there’s an indestructible Austrian cyborg with a big gun. What made Terminator so effective was that it played on people’s confusion over technological advancement. Sure, technological growth can be exciting, but Terminator was a thought provoking, frightening idea of where it could end up in future. The most effective horror taps into what’s socially and culturally relevant, then bends and twists it into something sinister. Memetic does this to great effect. We’ve all seen memes clogging up our social media every day. Usually they’re harmless, cute and funny. The best ones become viral sensations, accelerating across the internet so fast they’re on most people’s screens within a few hours. Unavoidable. Well imagine if one of those little adorable animal pictures you see on your newsfeed everyday had the power to bring about the end of the world. 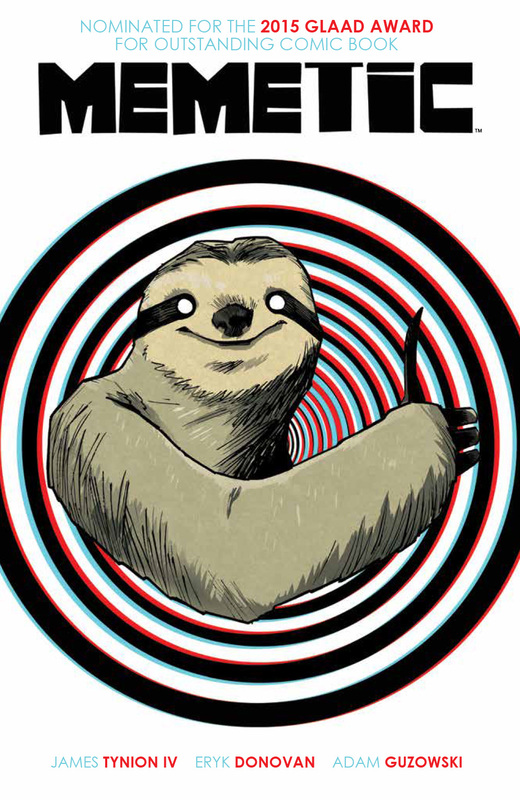 In Memetic, the culprit is the ‘’Good Times Sloth’’ – a furry little delight whose image brainwashes society into hysteria, turning logical people into bloodthirsty, homicidal maniacs out to kill those not entranced. Where did this image come from? Who made it? Why do they want to destroy the human race? The internet, for all its pictures of lovable rodents, can be a dangerous thing. Information can spread fast and vast, and is often used as a Launchpad for bad people to spread a message and sometimes that message is alluring to people. That’s when it gets dangerous. Memetic takes that idea and amplifies it, to create an epic apocalyptic tale that’s disturbing, thrilling and full of twists and turns. Tales about the world as we know coming to an end are a dime a dozen, but Memetic stands out as one of the more original offerings. The artwork by Eryk Donovan is hypnotic. There are images here that made me feel slightly dizzy. If you’ve ever read Uzumaki, then you’ll get a brief idea of how disorienting some of the artwork is in Memetic. It’s so psychedelic and bizarre at times. There’s even a nod to the movie Hausu, which is one of the trippiest experiences a human being could have sober. I can’t recommend Memetic enough. This is a must read for horror fans, especially those of some of the bonkers manga from Japan it’s clearly inspired by. Memetic is disturbing and unsettling and wholly original, with some thought provoking social commentary that’s truly bleak. A masterpiece.